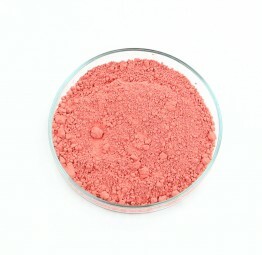 Zirconium Red | Spinel Pigments & similar Pigments | Pigments of Modern Age | Pigments | Kremer Pigments Inc. The lightfastness and resistance to chemicals are excellent (8/8/8), nevertheless the use in very acidic mediums is not recommended. Zirkoniuim Red is stable at temperatures up to 1300° C. The hue is in between a bright Iron Oxide Red (48100) and a Cadmium Red (21130). Customer evaluation for "Zirconium Red"